So you need to do some back yard landscaping? Welcome to Dream Yard where we have some great information for you. We are glad you found our site. Our goal is to help you build your dream yard. This article will be dealing with some basic principles about backyard landscaping with some helpful design tips. This is a great place to start before checking out other areas of our site. We also have a picture ideas section, and a how-to section for do-it-yourselfers. For Pinterest users we have over 4000 categorized pictures for you to check out. Please click on the Pinterest follow us link in the sidebar. If you are new to landscaping and designing, we suggest you take a look at our article on landscaping planning. It deals with all the practical things that are often overlooked before starting to design your yard. Understanding this information leads to a successful design that won't have to be modified or altered. Landscape design is a pretty extensive course, so we are just going to touch on some basics that are related to back yard landscaping. So let’s get started with a few different concepts. Living room, den, (family) Areas for relaxing or entertaining. Recreation rooms for pool, table tennis, darts, tv. etc. Kitchen and dining area, which are often combined. The larger your house, the easier it is to keep the purpose of each room separate. If you only have a four room house, having all the same functions as a ten room house will not work. It will end up looking cluttered and poorly designed. Here is an example of two different rooms. The pool is the recreation area, with a low wall dividing it from the kids play room in the back corner. Photo compliments of Ogs Landscape Group. The same thing applies to designing your backyard landscape. Keep in mind the overall purpose and function you want, in relation to the size yard you have to work with. Today's yards are often small and limiting in their use. Don't force too many "wants" in your design, if you don't have the space to accommodate them. Your kitchen area might be a patio area with a BBQ. This usually doubles as an outdoor family area for entertaining. A utility (service) area (which might be located on the side of the house), and contain an air conditioner, shed, hoses, or garbage bins. A private area could be a small deck or patio off a master bedroom. A recreation area for larger yards may have a swimming pool or badminton area. How will this information help you with your backyard landscape designs? It allows you to keep in mind the “purpose” and “function” of each area and how they are used effectively. Think about the importance of the uses of your outdoor rooms and how often they will be used. This will help you decide on how many rooms you may have, and what the rooms will be. For example, If you have children, you will probably have a recreation area that may include a play set, swings, slide, etc. With back yard landscaping, try to limit the number of purposes served in each area. For example, having a family area with deck, a BBQ, patio furniture, a firepit, stacked firewood, garbage bins, clothesline, and a hot tub, is neither practical nor functional. Having this many purposes for one area, makes the overall design cluttered and awkward. Use your whole yard wisely separating uses and rooms to balance the overall design. You control the ability to create and divide these rooms in back yard landscaping. A nice example of controlling the flow of traffic with a stepping stone pathway. The pathway and garden beds are also dividing rooms in this yard. Just like walls separate the rooms in your house, paths, walkways, garden beds, shrubs, hedges, tree lines, and fences can all be used to divide rooms in your backyard. You also have the ability to control the flow of traffic through your yard between, and through the rooms. So, a short summary so far is to design with purpose and function. Try to keep “rooms” separate with back yard landscaping and limit the number of purposes in each room. Tying in the concept of rooms with basic priciples of design, will make your overall design a success. So here are a few of the principles that you should try and keep in mind when designing your backyard. Always keep in mind that you are never going to be able to use all these principles successfully. However, the more you can incorporate into your design, the better chance you will have of achieving an overall “unity” and “flow” to your yard. Once you achieve this, your design will look right. Understanding two words that make it difficult to fail in design. We all have different wants and needs, so always make your back yard landscaping design is practical and functional. for you and your family. Here are some of the other basic principles to remember. Balance - Although most of us have a pretty good ability to achieve this naturally, we need to understand that there is more to balance than just symmetrical mirror imaging. Symmetric (perfect) balance is a mirror image split down the middle. For example: A garden bed with the same size and number of plants, shrubs, or trees on each side. We often see this at the front of a house with the front door being the divider. This is a very formal type of design. For example: A garden bed with both sides having close to similar size, number, and shape of features, but not mirror imaged. This is considered to be a more informal type of design. The last type of balance is distal, here/there balance, or near/far. Be careful with this balance as you can plan your “here” on paper, without fully understanding the “there”. An example of this would be off property features (buildings, trees, mountains). These cannot be seen when you are sitting at your kitchen table or computer creating your design, but they can certainly affect the balance of your design when it is implemented. Designing tip To avoid problems with this type of balance, work with pictures from all angles of your yard when at the design table. Place them around the perimeter of your work space. It may also help you to have pictures of the movement of the sun as well. Focal points - Every design has some sort of focal point. In a yard there can be more than one. The focal point in the front of the house should be the front door, with the whole design leading up to the front entryway to compliment it. For back yard landscaping, you may have more than one focal point. A corner bed could have a nice tree as a focal point complimented by some smaller shrubs. A nice stone patio with a hearth, may be another focal point in the center of the family area. Try to limit your design to one focal point to each “room” in your yard to avoid visual confusion. Proportion - This is often overlooked as a design principle. It usually works in conjunction with balance. A great example of proportion is when planting trees. Tall trees are in proportion beside two-story homes, medium and small trees beside ranch or bungalow style homes. From working with natural stone patios and walls, I often had to consider the size of my projects, in proportion to the rest of the yard. I know that most of us understand this concept, it's just that we forget about it. A before and after shot of a renoscape. Practical is the washed limestone perimeter against the house where grass never really flourished. Nice easy mowable lines with a simple easy to maintain design. A low natural stone wall replaced the old cinder block wall. Rhythm - One of the simplest examples of rhythm is interval planting. If you have a walkway that is 50 feet long and you want to plant some shrubs alongside the walkway, keep a good rhythm by planting them at measured intervals of 5 or 10 feet apart. Line - Lines are the borders created where different features like walkways, paths, driveways, and garden beds, might meet or border a lawn or driveway. If I could stress one thing about lines, it would be to make them practical. Effective back yard landscaping means being able to follow lines, mow strips, and other borders with a lawn mower easily. Don't create awkward strips of grass or anything else that would be difficult to mow or maintain. Simplicity - Keep things simple. Try to limit the use of too much of anything. Too many varieties of plants, trees, or colours can also make a busy, confusing, and cluttered design. I know a busy English garden does not conform to this, but they are unique. So these are some of the priciples that designers follow to achieve “unity” and “flow” to a design. Remember: The appearance you give your design, changes from any viewpoint in the backyard. You should consider the view from all angles as you move around the yard, when planning your backyard landscape designs. The point here is to make your design “viewable” from different places in your yard. You can also make focal points to be enjoyed from inside the house. 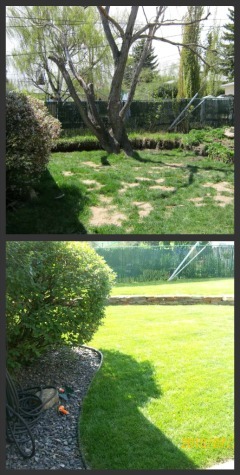 How many people consider back yard landscaping from the inside of their house? If you spend a lot of time in a living room with a picture window, have a feature in your yard that you can see from here. For someone that spends a lot of time in a kitchen, a visible herb garden not only will be a nice view, but might also spawn some creative cooking ideas. Making focal points to be enjoyed from frequently used areas is called "Framing a view". Lighting is used here for safe travel around this patio area and firepit. Photo compliments of Niche Gardens Landscaping. Lighting should always be considered not only for safety when using your yard at night, but also to compliment your design, and focal points. The four basic categories of lighting are: uplighting, backlighting, shadowing, and downlighting. Decide on what function you want your lights to perform, and where you want them before you choose the right lights. Remember to keep in mind the basic principles you learned above when dealing with lighting. They may not all apply to lighting, so keep in mind the most important ones. Balance, simplicity, and good proportion, are definitely factors that will contribute to successful lighting. You want your lighting to have a consistent flow. Lighting is an important part of back yard landscaping with far too much to cover in a few paragraphs. We are hoping to add a new section specifically on lighting to our sight very soon. It may be a little more challenging for new designers, but making your back yard landscaping appear interesting in all different seasons is important. This is something that should be incorporated into your design. Ornamental grasses, evergreens, pine, spruce, large boulders and rocks, statues, birdbaths, stone walls, etc. There are so many things you can incorporate into a design that will give you year round colour or interest even in a northern climate. Consider adding some of these elements to your design now. What would we like you to take from this article? 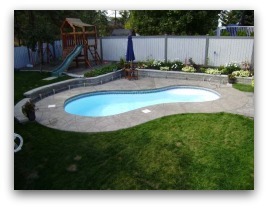 We want you to have a backyard that looks good at any time of the year, is practical, functional, and well planned. Select the most appropriate needs and wants that will suit the size of yard you have to work with. Plan your focal points first, and then choose things to compliment them, not overpower them. Use repetition to create a nice rhythm giving unity to your design. Keep things as simple as you can. Design with purpose and function, making it as practical as possible. 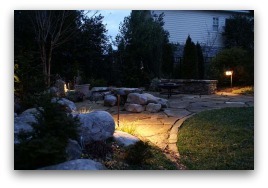 Use lighting effectively for safety as well as to accent your back yard landscaping. Separate your outdoor rooms when possible, and remember that you have the ability to control the flow of traffic around your yard. Make it a viewable yard from any direction as you travel through it. Choosing plants, shrubs, trees and flowers for your design, is the next thing you will need to consider. We will be discussing this in another article. 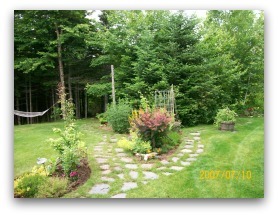 Be sure to visit our section on backyard landscaping picture ideas. We will be adding new pictures as we receive new submissions.